NOTE: We have no internships available, see also this web page. The Institute for Robotics and Process Control is one of the oldest chairs in robotics in Germany and was founded in 1986 by Prof. a.D. Dr.-Ing. F. Wahl and has been directed by Prof. Wahl until 2014. Over the years it has focused on many important fundamental and applied topics in robotics, in particular in sensor based control, robot programming with manipulation primitives, industrial handling, human-machine collaboration, mobile robotics, and robotics in production systems. The spin-off Reflexxes has since 2010 professionalized online trajectory generation, setting the commercial standard in this field until today. Also in medical robotics the iRP has set milestones in robotics-assisted setting of bones or positioning of endoscopes. A second important field of work was computer vision. In a number of industrial collaboration projects, the iRP has in particular pioneered visually guided automated driving. Furthermore, 3D-reconstruction algorithms have been developed and a successful spin-off for scanner technology was founded. In October 2016, Prof. Dr. Jochen Steil was appointed new head of the iRP. The institute's main activities now comprise teaching and research in advanced robotics, robot learning, sensor-based manipulation, and process modeling. 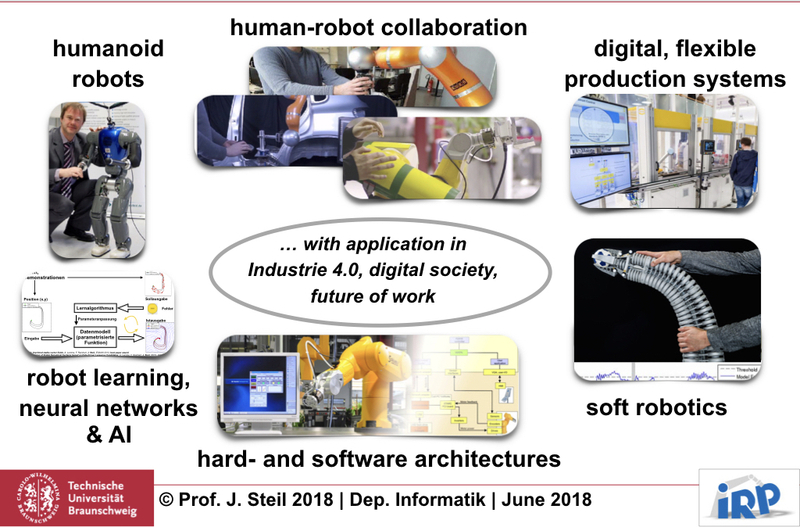 Relevant activities concern also the integration and role of robotics in production systems and more generally in the context of Industrie 4.0 and the digitalized society, where Prof. Steil has been advisor to several public bodies on the future of work and robot ethics. The institute coordinates the European H2020 project CogIMon - Cognitive Interaction in Motion -- and is member of euRobotics, the European joint association of robot industry and research. It runs several industrial transfer projects and collaborates with the Zukunftsallianz Maschinenbau Norddeutschland to support in particular SME on the road to robotics-based innovation. The iRP contributes to the teaching in computer science and run the respective specialization in robotics. The offers to students fundamental lectures in robotics, computer vision and process control, hands-on experience in practical labs, and a number of more specialized topics in robot learning, robot control, and cognitive robotics. Coursework and masterthesis can rely on excellent supervision and very good hardware and software basis. All courses are open to students from computer science and engineering. From April 2016-April 2018, the Wearable Computing Lab was associated to the iRP and headed by Jun.-Prof. Dr. J. Cheng. The group was working on ubiquitous and pervasive computing including both wearable computing and ambient intelligence and focuses on applications in human related areas like healthcare, sport, daily activity recognition. From Mai 2018, Jun-Prof. Dr. J. Cheng has attained a chair at the University of Science and Technology of China (USTC), a national research university in Hefei, Anhui, China, under the direct leadership of the Chinese Academy of Sciences.